When Alex Shor heard that he was a match for a stranger in Israel who would likely die without a stem cell transplant, he didn't think twice before saying "yes." "If I today I help somebody, tomorrow I want somebody to help me too if I [am] sick," said Shor. "I don't think too much about it." The request came from Ezer Mizion, an Israeli health service with the world's largest Jewish bone marrow registry, counting over 850,000 registrants worldwide. Shor said the representative told him the recipient would be a 63-year-old man in Israel. Shor, 41, had registered his DNA with the registry 10 years ago when he lived in Israel. Shor and his family emigrated to Winnipeg nearly three years ago. In March, he got word that his stem cells were a match. Stem cells are immature blood cells that can grow into healthy cells. They can make the difference between life and death for people with various forms of cancer, blood-related illnesses and metabolic disorders. Shor was a genetic match for the man based on the human leukocyte antigen (HLA) system, which codes the human immune system. The pair would have had to have 10 of the same HLA markers to be a viable match. In May, Shor went to a lab in Winnipeg to draw blood to send off to Israel to ensure his blood would be compatible with the recipient's. 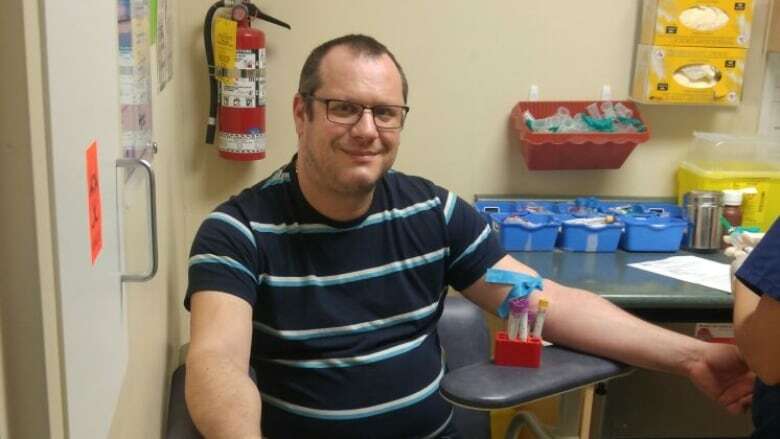 Now, he plans to travel to Israel to donate his stem cells as soon as he hears from the physicians that the patient's condition has improved enough to tolerate the procedure. Getting Shor's blood to Israel required a cooler, a courier and some creativity. Vials of Shor's blood were transported to Israel in an ice-packed Thermos. ​Dena Bensalmon, Canadian director of Israeli health service Ezer Mizion, put out a call on Facebook for a chaperone that could transport five vials of Shor's blood. "Sixteen people came forward within about four minutes," she said. One woman — the perfect candidate — was travelling from Winnipeg to Toronto, then on to Isreal. They packed the blood in ice in a Coleman thermos for the 12-hour journey. "I met Dina in Toronto and then I switched the ice packs. They took the blood directly," she said. Canada's OneMatch registry through Canadian Blood Services has about 400,000 registrants. But "if a person is Jewish, then the chances of them finding their match on a Jewish registry is far greater than them finding their match on a non-Jewish registry," said Bensalmon. Canadian Blood Services has access to nearly 29 million volunteer donors and more than 720,000 cord blood units from dozens of countries around the world, as all the registries are connected under the umbrella of the World Marrow Donor Association, comprised of millions of people from across the world. "I find the whole thing almost like watching a circle of life," said Bensalmon. A volunteer brought vials of Shor's blood to Israel. She kept the thermos in her lap the whole 12-hour trip. Shor said he just thought of his own father and how he would want someone to help him if he had a life-threatening illness. He encourages everyone to join a stem-cell registry. "Tomorrow you may save somebody and tomorrow you don't know if you be sick and somebody save you," said Shor. Why are Canadians over 35 barred from signing up to donate bone marrow?